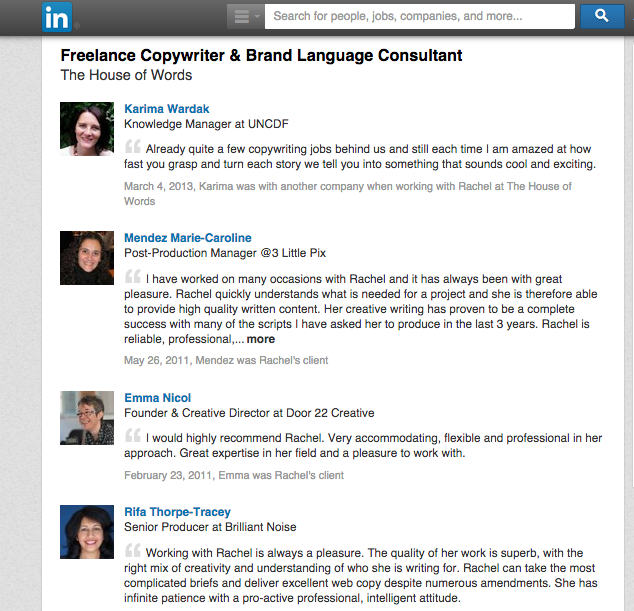 I’m Rachel – a freelance copywriter based in the UK. With a love of language and a solid marketing background, I create clear and powerful copy. For 15 years, I’ve been helping agencies and their clients to communicate with flair and precision. Floating between sectors, I find the art of copywriting remains the same. Browse my client list to see who I’ve been working with. You may need web copy to fit your existing designs, wireframes, keywords and character counts, or want to start from a clean slate. My experience includes writing websites, film and interview scripts, email campaigns, social media posts, blog posts and content for A/B multivariate testing. Even more than a logo or colour, copy defines a brand. With words, I can develop a feeling and flavour that will pervade your communications. Collaborating with brand strategists, I develop stories, books, values and tone of voice guidelines. Much of this work is confidential and protected under NDAs, which is why it does not appear in my portfolio. Come and follow The House of Words on twitter, where I celebrate powerful writing and share words used in interesting or unusual ways. Connect with me on LinkedIn here. Call +44(0)7779 255201 or email me to discuss your project.